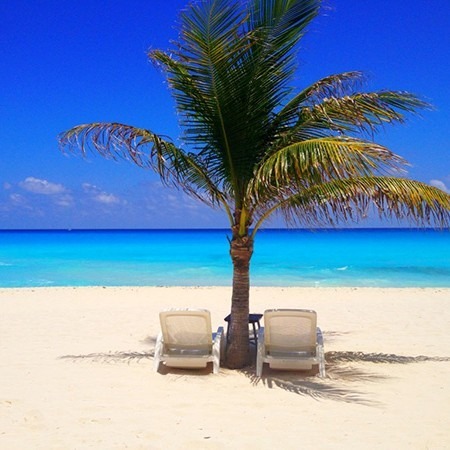 One of the most visited touristic destinations in the Mexican Caribbean is “Tulum”. Through recent years, Tulum has received uncounted recognitions because of its natural and Archaeological beauty. One of the reasons Tulum receives so many awards is because of the proximity of the Mayan ruins and castle to the sea, where you get the feeling of time travel in a blink of an eye. Its undersea paradise is qualified as one of the most extensive ones with over 1.500 km in coral reef with over 60 different kinds of coral and marine life. It’s fauna is an amazing miracle with over four different kinds of sea turtles who travel across the ocean just to lay their eggs in Tulum’s sea shores, it’s a once in a lifetime experience to witness this event every year. You can observe their selective bird species, hosting beautiful and colorful pelicans, their elegant white heron’s, as well as red deers, all kinds of butterflies making Tulum an exotic paradise. Tulum’s deserted beach, with no big hotels invading the shores, is another reason that makes it so special. Unlike other touristic destinations Tulum’s most common accommodations you’ll find will be cabins along the shore that promote their eco-friendly awareness, they explain all of this to you as you make your reservations. Most of the eco-cabins in Tulum don’t have electricity. The reason for this is to preserve their famous clear starred sky bonfires by the sea only available on the shores, giving you a one of a kind experience surrounded by the Tropical Forrest and the breeze of the sea. Bugalow’s are one of the most common accommodations in Tulum and “Azulik” offering a unique experience with their no electricity policy among their beachfront villas, candle light is the way to go, to delight your sight in this all wood and glass sea castle. The easiest way to get to this amazing place is to arrange a shuttle from Cancun to Tulum or if you rather drive, you can take Tulum’s highway. One of it’s main attractions is the mayan ruins located just by the shore on top of a cliff and made out of limestone. This wall was specifically built to protect Tulum’s Mayan City that used to be one an important jade and turquoise trading seaport in ancient times. When you visit it, you’ll be able to find some of the remains of the wall that surrounded the city. The entrance fee is around $50 pesos ($5 USD). Up north of Tulum ruins you’ll find paradise beach, where you can either snorkel or go scuba diving and discover the wonders of the caribbean sea in front row. If you’ve already done the ruins and want to try something different, there is a unique place to go “El grán cenote”. A “cenote” is a natural pit or sinkhole that exposes groundwater underneath it, in ancient times mayans used them for sacrificial offerings. “El gran cenote” is ideal for swimming and diving. it’s located just 20 miles outside tulum. To get there you need to head towards Cobá and look for the sign of “Gran Cenote”. Its listed as the #33 attraction out of a 77 activities listed by Trip Advisor. As you can see, the reasons to consider Tulum a paradise are that it is one of a kind and for it’s spiritual nature. This is a place to go and completely disconnect from everything, work, stress, etc. So the next time you plan your dental treatment in Mexico, don’t miss Tulum.